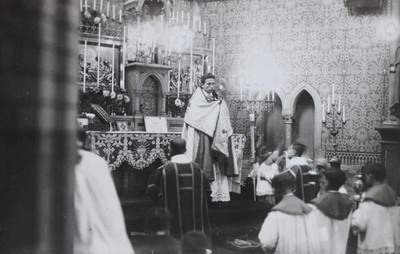 "Adoration of the Blessed Sacrament"
Fr. Léon Gosset, after his first mass in his village of Kinkenpois, is the main celebrant for the Blessed Sacrament adoration. Adoration of the Blessed Sacrament. September 9, 1928. Société des Auxiliaires des Missions (SAM) China Photograph Collection, Whitworth University Library, Spokane.